(Travel + Leisure) -- I'd all but given up on resort vacations for my family. I just couldn't take the food. As the editor of Food & Wine magazine, I've grown accustomed to culinary adventures pretty much every day. But resort meals, with their overcooked pasta and tasteless chicken, managed to fall short of even my lowest expectations. Blackberry Farm has long pampered guests with fly-fishing and fine dining. Blackberry Farm, in the foothills of the Smokies, in eastern Tennessee, promised to be different. The 4,200- acre resort, which started out in 1976 as a six-room inn, was founded by Sandy and Kreis Beall, owners of the Ruby Tuesday restaurant chain. It has long pampered guests with fly-fishing, white-tablecloth dining and rooms of Georgian furniture. Now the Bealls' son, Sam, who apprenticed at Napa's French Laundry, has turned it into a culinary retreat, with an heirloom garden, a state-of-the-art demonstration kitchen and a New American restaurant that puts Blackberry's bounty to full use. A plush farm with excellent food? I booked eight days in August for me, my husband, Barclay, and our kids, Sylvie, 7, and William, 5. And then I began to fret. Barclay and Sylvie enjoy good cooking, but would they be as excited as I was about Blackberry's new jammery? Would the food be too rarefied for my picky son, who likes overdone pasta? The road from the Knoxville airport to the town of Walland is lined with auto-repair shops and fast-food joints -- which makes the sight of Blackberry Farm even more welcome. Paved paths crisscross manicured meadows, and to get from, say, the sheep-grazing ground to the edge of the Appalachian Trail, most people tool around in golf carts, one of which we're issued at check-in. With Barclay at the wheel, me beside him, and the kids sitting with their backs to us, feet dangling, we drive to Arcuna and Leather Britches, our adjoining cottages. Named after a Tennessee chicken breed and a string bean, respectively, the structures have airy vaulted rooms. We plant our bags; lunch awaits on the main house's veranda overlooking a misty valley with the Great Smoky Mountains beyond. The cook is by the grill, tongs in hand, ready to pull barbecued beef brisket off the heat. I help myself to just-picked greens, sliced tomatoes and lemony rice and peas -- as if this will be the only decent meal I'll have all week. Sylvie is so crazy about the rice salad that she decides to start a food diary like the one I keep. Her first entry: "Tomatoes, too sweet. Lemon rice, perfect." 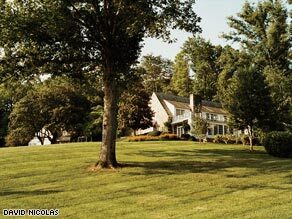 Blackberry Farm has all the conventional resort amenities: tennis courts, pool, game room and spa (in a late-1800s house original to the property). It also hires local specialists to lead outings. On a woodland hike, our guide shows us bear tracks and teaches us how to soothe mosquito bites with jewelweed sap. We ride horseback with someone who once worked in the circus. William and Sylvie aren't keen to try the kids' camp, but we do sign them on for the three-day children's cooking course. Held in a 19th-century bank barn that also houses the new restaurant and 160,000-bottle wine cellar, the class for 10 is set up like one for adults, with tall director's chairs facing a stove and large limestone island. When we arrive, William realizes this is a kids-only project and hangs on to my leg until the instructor, Helen DeFrance, who runs a children's cooking school in Jackson, Mississippi, explains that she needs him as a special helper. Without William, she won't be able to make the blackberry ice cubes. Barclay and I sneak off for massages. The next morning the class meets in the garden, the heart of Blackberry life. Overseen by John Coykendall -- a Tennessee farmer who is one of America's great seed savers -- it's planted with heritage varietals at risk of disappearing, such as Choppee okra, and green-striped white Cushaw squash that dates to before 1700. Carrying wooden baskets, the children gather ingredients for a parents' and kids' lunch that they prepare: strawberry soup, BLT's in pita pockets and watermelon cookies -- Sylvie gets to choose the green for the "rind." My notes for her: "Rind is the perfect shade. Faux pits could be darker." Once school is over, our cooking ventures continue. We make yogurt with milk from the farm's East Friesian sheep, and turn peaches into preserves. Every day we eat incredibly well. Our dinner at the culinary center, cooked by chef Peter Glander, is one of my favorite meals of the year. The ceiling beams put me in mind of a hickory-smoked church where rustic and divine come together, an apt metaphor for Glander's food. Sitting under a wrought-iron chandelier, we have the eight-course tasting menu, which includes onion-and-hyssop ravioli, Wagyu beef and field peas. Having requested plain pasta -- as he did at every meal, including breakfast -- William uses a large silver fork to hoist a mass of fine egg noodles. Sylvie, linen napkin tucked into her dress, tries what we're having. Her notes: "Wagyu: WOW. I want more." One evening there's a cookout by the garden. The sun is outlining the tips of the trees when we arrive. The family-style meal mixes all the guests at long tables, and platters of grilled corn and chicken go from hand to hand, followed by peaches with vanilla ice cream. Two fiddlers start playing, and William jumps from the table to dance. Back in our rooms, we put on the duo's CD and pick up where we'd left off. As a family, we've never stayed in nicer quarters. But the real treat is being in the woods of Tennessee, and knowing it with every bite.